I am thinking of using a monolithic foundation for my shop, but there is about a 1 foot drop in elevation where we will be locating it. Will this still work and, if so, what changes will need to be made? The 12 inch drop you mentioned is relative to what? Is it from your driveway, or is the property 12 inches lower than city street, neighbor's yard, etc. Not knowing these make it difficult to come up with the exact answer you're looking for. Given this is only 12 inch drop, it is pretty small and can be easily dealt with. 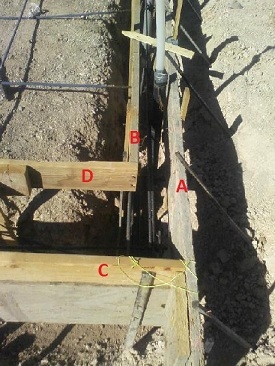 The most important thing to understand when excavating monolithic foundations or any type of foundations is to make sure the bottom of footings are level. A level foundations will ensure no movements take place during such events as wind storms and earthquakes. 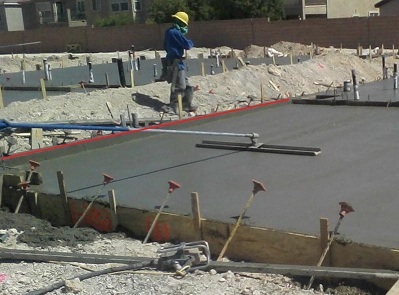 The photo above is a monolithic slab formed ready to pour. The outside forms designated by letters A and C are not only the exterior forms but they outline the perimeter of the structure. This form is usually the biggest in this case is a 2x12 even though the hole is 3ft deep. Since only 8 to 10 inches of the foundations will be exposed, the 2x12 works great in this application. The inside forms B and D are 2x4s that can form or outline a curb wall elevating above at the garage slab. Due to the 12 inches drop that you have, you may need to use 18 to 24 inches form at the exterior and 12 inch deep form at the interior the same way it is arranged as shown in the photo above. The exterior forms will remain throughout the pour and finish while the interior forms will be removed as soon as the concrete is hardened enough for the forms to be removed in order for the surface to be finished as shown in the photo above. Notice the red line which is the top of the poured curb wall or the top of the foundation. The curb in the photo is 8 inches high, 4 inches shorter than the 12 inch you have - the method of forming of your shop should be very similar to what is shown in the above monolithic slab photos.